SPARTANBURG, S.C. – Panthers star tight end Greg Olsen chose team over himself. Olsen reported to training camp on time Tuesday, saying he didn’t want to hold out and be a distraction to an organization aiming to win its first Super Bowl. Olsen caught 80 passes for 1,073 yards and three touchdowns last season. He has 32 TD catches in six seasons with the Panthers. “We feel very strongly about what we have been able to accomplish these last couple of years,” Olsen said. It’s unclear when Olsen will get a new deal. Carolina recently shook up its front office, firing general manager Dave Gettleman and replacing him with Marty Hurney on an interim basis. The decision was made, in part, because Gettleman didn’t grant contract extensions to Olsen and linebacker Thomas Davis, two of Carolina’s most popular players. Olsen has a better working relationship with Hurney, who was responsible for bringing him to Carolina via trade in 2011 when he was the full-time GM. Olsen said he met with Hurney after he was hired, that they had a “good talk” and understand each other’s positioning on contract negotiations. But despite the change in the front office Olsen said he’s been given “no promises” a deal will be worked out anytime soon. With Olsen having two years left the Panthers may be more inclined to wait lest they set a precedent through which other players with multiple years remaining on their contracts begin asking for new deals. Davis, who also reported to training camp on time, is more likely to get an extension because he has one year left on his contract. Davis was not immediately available for interviews. 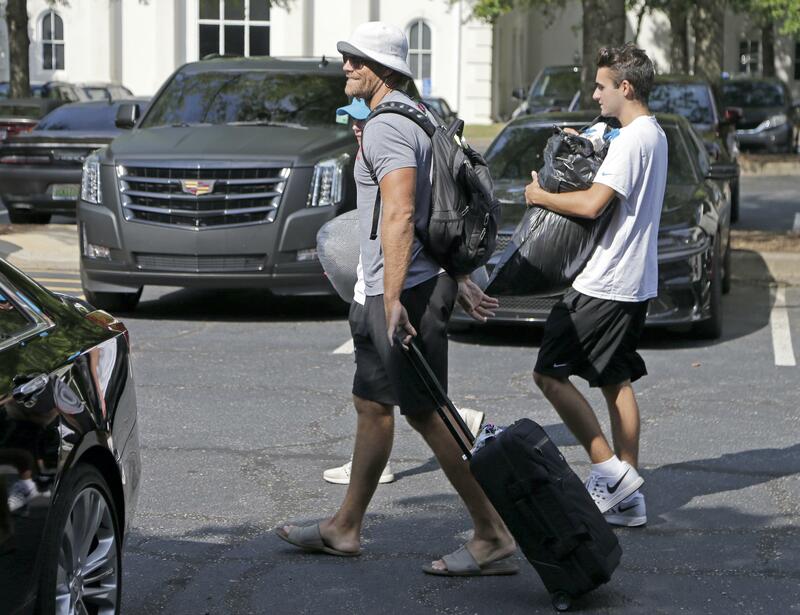 Panthers coach Ron Rivera said there was no doubt in his mind Olsen and Davis – both team captains – would show up for camp. Former Panthers offensive tackle Michael Oher recently suggested on Instagram that some players in the locker room were responsible for Gettleman being fired, and warned that karma would come back to get them. Olsen said he had a good relationship with Gettleman, although he added that they didn’t always see eye to eye. “As far as any personal grudges or animosity that brewed from all of this was just not the case,” Olsen said. The Panthers have added several veterans to their roster this offseason, including defensive end Julius Peppers, left tackle Matt Kalil, cornerback Captain Munnerlyn and safety Mike Adams. Carolina went to the Super Bowl after the 2015 season, but lost 24-10 to the Denver Broncos. Injuries and some inconsistent play by quarterback Cam Newton contributed to a 6-10 record last year. Published: July 25, 2017, 8:50 a.m. Updated: July 25, 2017, 12:47 p.m.